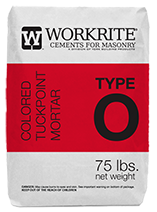 WORKRITE® Tuckpoint colored mortar is a Type O, lime-based cement designed with minimal percentage of Portland Cement to create a mortar for use in restoration and tuck-pointing applications. This unique formula conforms to ASTM requirements and the standards of the masonry and historic restoration industries. A special lime-based tuckpoint mortar typically used for restoration work.